NEW! LISTEN TO REAL PULSATILE TINNITUS SOUNDS RECORDED BY REAL WHOOSHERS! In the last year or two, with the help of iPhones and similar devices with recording functions, many whooshers have recorded their whooshes and emailed the sound files to me. How neat! This page has been here for a few years, with sound files I've collected that sound similar to whooshing sounds, and I encourage everyone to continue to explore them, but I'm going to be posting more of these REAL WHOOSHING sound files as they come in. As a reminder, pulsatile tinnitus can be objective (others can hear it) or subjective (only the patient can hear it). Obviously, these files are recorded by folks with objective pulsatile tinnitus. But, I wonder, of those people diagnosed with subjective pulsatile tinnitus, how many actually have objective pulsatile tinnitus? Sometimes the sound can be difficult to listen to, even with a stethoscope. And as most of the whooshers who sent in their audio recordings told me, sometimes it takes a few tries to find the right spot on the head or neck to find the sound. MORE AUDIO RECORDINGS ARE POSTED OFTEN! VISIT AGAIN SOON! From Charley: "To get the recording, I just used the Voice Memo Recorder App on my iPhone (the one that comes with the phone, not a downloaded one), and I just put the bottom of the phone against my ear with the microphone over the opening of my ear canal. I found it was better to wait until late at night to record it so that it was quiet. When I tried doing it during the day, you could hear the birds chirping outside & stuff. My doctor hasn't told me much about what he thinks may be causing it. I've had an MRI/MRA which was normal but my Neurologist said they are notoriously unreliable, so he's chatting with a Neurosurgeon about maybe doing a Cerebral Angiogram. Glad I've been able to help you with this. Like I said, your site has done so much for me with giving me information and even just other people with PT to talk to so I know I'm not alone." From Crystal: I stumbled across your site while doing research of my own and decided to see if I could record my own whooshing. Sure enough it worked, so I thought I would share! My whooshing can have a few different sounds depending on the angle of my head and jaw. I am going in for an MRA at the end of March ... hopefully they find something because I've had this sound in my ear since last November and it's really starting to drive me nuts! Click to Hear Danielle's Whoosh! Danielle's Story: "I don't know if you can help me but I'm getting really desperate now. I have been hearing a pulsing sound in my right ear for over a year now. I have attached a recording I made on my phone whilst holding it up to my ear tonight. Other people can hear it too but I have seen the ENT twice who told me he doesn't know what's wrong with me and I will just have to learn to live with it but I can't accept that. I'm 22 years old and I can't live the rest of my life with this horrible noise in my ear. I have had an MRI scan which had normal results and an ultrasound of my neck with normal results as you can see the pulsing is obviously there which isn't normal. It all started last November I had excruciating pain in my neck which came on suddenly without reason. I then had an excruciating headache to go with it. It felt like someone was squeezing my skull I saw the doctor and she told me I had a cricked neck and that I should take painkillers so I went home and took more painkillers, pain was still there so I bought extra strength painkillers which contained paracetamol, aspirin and caffeine. I took these painkillers max dose every four hours for 3 days but the pain still didn't go so I took ibuprofen I then started vomiting and came up in a rash so I resorted back to paracetamol and saw the doctor. She told me I was having an allergic reaction to ibuprofen and prescribed me diazepam to relax my muscles I didn't want to take them so continued to take paracetamol until a few days later the pain suddenly disappeared but in its place the pulsing in my right ear began. The pulsing is in time with my heartbeat. In fact I can stop it by pressing on the big thick vein on the right side of my neck. I can also stop it by coughing but it comes back louder after just a second after coughing or holding my vein. It is worse when I lie down to sleep or watch telly or when I first wake up in the morning although it can start while I'm sat at my desk at work. When it starts pulsing I can't hear anything as it is so loud it makes speaking and listening to my friends family and colleagues impossible unless I hold the vein in my neck so I can hear. I am recently starting to suffer with headache and earache on my right side of my head and ear. I really need some help I don't know what else I can do." Dawn's Story: "One loud whoosh morning, I was determined to record it. It took a few hours but I finally recorded my eye whoosh AND ear whoosh. It was such a relief to actually hear it play back. When I let my husband and kids listen, they looked at me and I feel like they really got it. You have to listen closely but you can hear it. I used ITalk from my iPhone to record. It was so loud this particular morning I just knew if I was patient I would be able to figure out a way to record it. I wonder how many of us actually have objective PT but docs just don't have the time to wait it out to find the exact place to listen. Trust me, it was hard for me to record and I feel like I know exactly where it is. It was so validating to be able to share this with my family." H's Story: "Thank you for posting such an informative site--it is great to know that I am not alone. I am female, age 39 and I have been experiencing this in my right ear for nearly 2 years. When I press on my carotid artery it goes away, but then rushes again as soon as I release pressure. I was amazed that people were able to record their whooshes, so I tried it and was successful. In my ear, it sounds a little more like an owl hooting than it does in the recording I took at my neck, but the fact that a microphone can pick it up gives me some validation that something is really there. I don't know if the doctor heard it through the stethoscope or not, but he scheduled an MRA for me next week. I am hoping that there will be something in the result." From Heather: "Currently getting a work up for the pulsatile tinnitus I've had for over six months. Primarily heard on right ear but I can detect it occasionally on the left but much more faint. I could not find a sound to compare it to so I followed your instructions and recorded over my mastoid bone. Also get a thrill or vibration at the base of my skull when I bear down. Hoping this will help them take me more seriously! Can you post to the web site so others have it as a reference? Will send more info as I get it! Thanks for such a helpful web site!" Click here to hear Jamie's Whoosh! Jamie's story: "Just thought I would say hello and contact you with my "whoosh". It was nice to find that other people had the same thing. I've had it in my left ear for over 4 months now. There is a high pitched rhythmic whooshing (in time with my heart) and a rasping sound which is only there when it gets loud. I went to see my GP about it after a couple of months (it hadn't gone away a I had hoped). I was told it's just tinnitus and basically to get used to it although it might just go away. He has referred me to ENT "just in case" but we have a 16 week waiting time apparently so I'll probably not be seen until January. It got worse; louder and more raspy/grating (my wife could hear it if she put her ear against mine) and went back to the GP. He said there was no way she could hear it, that all she could hear was my heart beat. I said I doubted this as she couldn't hear it on the other side. It wasn't bad the day I went to see him and he was unable to hear it (holding his stethoscope near my head). He laughed and said I should record it if it was audible. I tried at the time but all I got was static (you can't get an iphone very far into your ear). Long story short,it was much louder again today and I was able to record it. I thought it was worth sharing as when I searched online I wasn't really sure if what others were describing was what I could hear. I hope others do find it useful if you decide to put it up on the 'site. I emailed it to my GP too, just so he could see I wasn't imagining that others could hear it." Click Here to Hear Liz's Whoosh! After recording her pulsatile tinnitus (with an iPhone, by the way), Liz was diagnosed with brain dural arteriovenous fistula (BDAVF). She underwent a procedure to treat it and now she is a cured whoosher! Read her story HERE! Click Here to Hear Megan's Whoosh! From Megan: I recorded this after realizing others could hear it if they put a stethoscope up against my ear. I couldn't believe it! Finally others could hear the horrible sound I have been hearing for almost 3 weeks now. Peter's Story: "I've been whooshing for about a week now. Hope to find a cure." Since a lot of you were wondering exactly how these folks recorded their whooshes, here is Peter's explanation how he recorded his whoosh, along with a photo! "From the medial side of my head, the recorder was placed right before my left ear. Note that the iPhone microphone is on the left corner of the bottom of the phone. When this is pressed firmly against the area I perceived my whoosh loudest, it was able to be recorded. 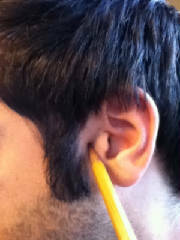 FYI, I have objective PT; others can hear it if they press their ear on this very spot. A picture with a pencil tip showing where the recording was taken may be helpful. My doctor also informed me that there is a "bruit" on my other ear as well. I have not noticed this." Click Here to Hear Rosie's Whoosh! From Rosie: "This is my noise, the clanging sound in the beginning and middle is a bin lid hitting a wall, but the rest of it is me." Sally's Story: "I started with PT about 2008, I've seen lots of doctors but only recently found one that's taking me seriously! At the moment my appointments are few and far between, but I hope one day soon you'll be adding my name to the [list of] cured whooshers! I've attached a recording of my PT (it's a bit fuzzy at the beginning and end due to moving the phone to and from my ear). I would also like to say, thank you for setting up the website. It's nice to know I'm not alone. :)"
Anyone with tinnitus, whether it's pulsatile or non-pulsatile, can relate to the frustration of hearing a sound that others can't. It's enough to make anyone crazy sometimes. And no matter how you try to explain the sound to others, there's simply no way for anyone to understand unless they get in your head. I have objective pulsatile tinnitus, which is rare. My doctors can hear my pulsatile tinnitus with a stethoscope. If your doctors can't hear your whoosh, then you have subjective pulsatile tinnitus. There's an older Whooshers.com post about objective vs subjective pulsatile tinnitus here. That my doctors can hear mine doesn't really mean they can truly empathize with the constant whooshing I hear or the energy (brain power) it takes to ignore it on a second-to-second basis. This kind of understanding is important as we try to cope and find answers. If you suffer from subjective pulsatile tinnitus -- or if you have objective pulsatile tinnitus but you'd like family members and friends to understand what your pulsatile tinnitus sounds like -- you might be able to find an audio file that sounds similar to your whoosh and play it for others to hear. No, these aren't official whooshes or real "pulsatile tinnitus" sounds... some are heart murmurs, venous hums, bruits, and others are electronically simulated sounds. In other words, I'm just suggesting that the sounds may mimic what we hear, not that because I hear a whoosh that sounds like a heart murmur (for example) that that means my whoosh is an indication of a heart condition. Only our doctors can truly determine a cause. I just thought, hey, my whoosh sounds like a heartbeat without the thump. So I did some online searching for "heartbeat sounds." I listened to as many as I could find, and I finally found one that sounded very much like mine. Mine sounds most like "ventricular septal defect" in Link #1. I downloaded it and played that audio file for my family and friends on my computer, even adjusting the volume to coincide with the volume of my whoosh in the room. They were SHOCKED, I tell you! I thought I'd been describing the sound well, but there's no replacement for actually hearing the sound. After hearing just a brief 30-seconds of whooshing via my computer, they had a whole new appreciation for what I was dealing with. They said, you hear THAT? ALL THE TIME????? If you haven't already, I encourage you to listen to these files. There are many! See if you can find a whoosh that sounds like yours. When you do, adjust the volume so it sounds as loud as your whoosh, and play it for others. Here's another great tip from one of our Facebook group members: try talking to people while they listen to the whooshing sound, too, so they may better understand how distracting the whoosh is! Another good idea is to download it to a device that you can take with you to your doctor's office. Some aspect of the sound (pitch, volume, etc.) may provide a hint as to the cause of your whoosh. You never know. At the very least, it may increase the compassion you receive at the doctor's office when you walk in and tell them you hear a noise. If you don't find a file above that sounds like your pulsatile tinnitus, do an online search for the sound you hear (for example, buzz, buzz, buzz or chirp, chirp chirp) to try to find some audio that sounds like what you hear. If you have trouble finding one like yours, I'd be happy to help you look! Chances are, someone else is just like you and can't identify theirs either. And if you do find a file that sounds like yours here or elsewhere, please send me an email to whooshers@gmail.com to let me know. Finding an audio file to play for my loved ones helped me relay what I'm going through. It helped people I know understand --even for just 30 seconds or a minute-- what my pulsatile tinnitus sounds like and why I spend so much energy trying to ignore it and get rid of it. HAVE YOU FOUND AN AUDIO FILE THAT SOUNDS LIKE YOUR WHOOSH? LET US KNOW!! I’m in Christchurch , New Zealand. I have a low base-like whoosing in my right ear which is not really a problem and in my left I have a very high pitched whoosing sound which is a real problem. My friend notified my of the whooshers.com site as I have now had my whoosh for just over a year with no specific answers or diagnosis for it. I had read about recording, then seen the audio samples. I would have to say that mine is closest to Jessica's, in my right ear. I have recently had an MRI and will be seen my neurologist in February. I have not fully gone through the whooshers.com site, but will in time as more questions arise. Thank you to everyone involved in the website and those that provide the information. My whooshing sound in left ear sounds exactly like Crystal's whoosh. It's been driving me mad for a couple of years now. Love to know what her diagnosis finally is. I don't think my doctor believes me. My whoosh sounds like... a high pitch dog whistle that pulses with my heartbeat...started off 2 years ago sounding like crickets in the distance. Also get loud "knocking" sounds in my ears when I'm laying down. My whoosh sounds like... Jessica's whoosh. Although I can only hear it. I just don't understand why others around me can't hear it. And what they say hers is, is one of the things they think mine is. I guess we will see come 3/4/13. Thanks for posting these. I have been looking for this noise so I can tell the doctor and anyone else what it sounds like. My whoosh sounds like...Jessica's whoosh. I have FMD in Left Carotid, but I hear Whoosh in Right ear. Is that usual? I only hear it when my neck is in a certain position and sometimes when I bend over. My whoosh sounds like...Jessica's! almost exactly!!! My whoosh sounds like...a baby's heartbeat during a doppler or on an ultrasound. It's so loud and it's fast. It goes faster than my pulse and in sequences. Every 30 seconds it pulses for 6-10 times then silence for 30 secs. Not sure how to record my dvf. My whoosh sounds like...Jessica's whoosh. This is very frustrating because I am a cardiac nurse and now I am having difficulty with listening to my patients' heart sounds. I have had a MRI/MRA and also a CT of the head and they cannot seem to find any abnormality. I need help. Are there any solutions?? My whoosh sounds like... a creaking door that's moving back and forth. The pitch and volume change constantly. My boyfriend can hear it, but not the doctor because it only happens at night! I was not able to record it, so I hope you post more sounds and that I can find something to show to a doctor. I have been to three doctors so far and they all think it's nothing and won't refer me. Thank you for your website. My whoosh sounds like...water swooshing in a bowl. It mainly happens when I turn over in bed. My whoosh sounds like...'crackles'. Like a sticky sound. Not as definite as a heartbeat. My whoosh sounds like Jessica's. My whoosh sounds like...Jessica's. I have been dealing with this for 19 years and can't get any doctor to help me. It's very loud and goes 24/7. Like other people, if I put pressure on a spot on my neck, it lessens. Can't take much more of this. My whoosh sounds like a heartbeat in my left ear. I woke up one morning a year ago and have never felt the same since. It goes away and comes back when it feels like it. After all the allergy meds and pills I am finally getting an MRA but only after basically begging my ent. My whoosh sounds like...Jessica's, sometimes louder sometimes softer, but subjective. I have been having this problem for almost two years. I have met two ENT specialists and I had a contrast CT scan. The diagnosis was "high jugular bone" [high jugular bulb] with no abnormal masses. Surprisingly my audiogram showed normal tinnitus. Luckily, my sleep is not disturbed so far. My whoosh sounds like...Jessica's in my right ear. At times there may be some added sounds such as cricket pulsing. Apparently mine is subjective as no one else can hear it. I have an android phone, no luck recording the sound with it. My whoosh sounds like...Jessica's woosh. Finally I can let the doctor hear what I hear every day. My whoosh sounds like...Jessica's, but louder. Also Objective. My husband hears it in bed. My whoosh sounds like... a constant radiator hissing, sometimes loud, sometimes soft. But I don't lose any sleep from it. Somehow I've gotten used to it, like it was always there. My whoosh sounds like...JESSICA! It is normally on the right side. I notice it most when my head feels congested, and I have more post-nasal drip/mucous than normal. Mine seems to almost go away at times. It started in July 2009, coinciding with a band of pressure around my head, pressure feeling on back of my head when laying down, bending forward, or going from laying down to sitting up position. I can also see my pulse in my eye sometimes too. Everything in my vision seems to shift a tiny bit with the pulsing. I've had MRI and MRA, this ruled out aneurysm. I feel it is connected to my sinus' as it seems "seasonal", and I notice it when I feel head congestion. At this time it is louder and more persistent than normal...it is almost June, and wondering if it has something to do with pollen/allergies too! My whoosh sounds like... Blood flowing through my brain all the time. My whoosh sounds like... Thunder. I also have the high pitch fiber optic sound in my left ear. I think I have it in my right, but I can't hear it because the left is so loud I can't make it out. I am completely disabled from this condition. It started in May 2011 as pressure in my left ear. I was first diagnosed with Meniere's disease, but doctor recently said she is pretty sure I do not have that disease due to extensive tests performed. I have been a part of Cleveland Clinic passed around from doctor to doctor now for 5 months with no answers. There latest stab is placing me on a migraine drugs. They would like for me to go into a three week rehab program for migraine sufferers. I would do that, but I really don't believe this is migraine as I just don't suffer from that many headaches. The whooshing has grown so bad I am now walking with a cane at 45 years old because of imbalance. I have fallen twice. I feel drunk all the time, whooshing, ringing, confused, and of course depressed. Wow! This is so much fun! Thank you for this. It is so difficult to explain to family and doctors. Mine sounds most closely like mitral regurgitation. My whoosh sounds like... A fetal heartbeat.. Varies in intensity. I was told by numerous doctors to live with it and I finally had a doctor (after a year of antibiotics for "sinus infections") that looked into it further and diagnosed me with intracranial hypertension. The whooshing gets louder when I have other symptoms present (headache) or just simply moving around because of increased heart rate. I recommend everyone asking if this is a possibility for their whooshing.. My intracranial pressure was dangerously high because I was misdiagnosed for so long. My whoosh sounds like... well... a few different things really! When it started it sounded like a pigeon cooing, now its just a whooshing noise. It varies in how loud or fast it pulses, but over the last few months it's sounded like a motorbike, a garden strimmer and a few noises I can't explain. It's really depressing me, I just hope when I see the consultant in next few months I get good news and become one of the many cured whooshers! My whoosh sounds like... very much like the pansystolic systolic murmur in link 3, very close! My whoosh sounds like...someone is saying eewww with every heartbeat. Mine is a constant thumping that does not go with my heartbeat, unless my heart is beating at 240 bpm, in which case I would probably be dead by now. I am still looking for an audio file to come close to matching it but can't. I will have my girlfiend bring her stethoscope home and I will try to record it later. http://jetcityorange.com/dog-whistle/dog-whistle-0.mp3 It's a constant shush, shush, shush, shush. The rate of the shushing depends on my heart rate. I used to get EXTREMELY upset by the pulsating shushing sound. It was like someone screaming in a high pitched voice in my ear constantly. I've been trying to train myself to perceive this sound as MY BODY, whenever I notice it. And if I wake up during the night and I hear it, I know if I breathe more slowly and stay very very calm, my heart rate will slow down, and I can fall back asleep. However, I've taken lately to playing constant white noise on an mp3 player next to the bed. Four different mp3 files. Waves + "jet" + a dishwasher. I downloaded them from here: https://ccrma.stanford.edu/~dattorro/Tin/tin.html. It's so difficult to fall asleep in a quiet room. The effort it requires to do so doesn't let my brain relax enough to fall asleep. A bit of a paradox... I can't hear the 12,000 hz mp3 sound in my ear having the pulsatile tinnitus. I don't know if it's because the tinnitus is drowning it out, or due to damaged hearing. I can hear it in the non-pulsatile ear. I think I have steady pitched tinnitus in both ears, but this shushing noise is so loud and distracting, I can't really separate those out for certain. My whoosh sounds like...a bug zapper--a ping like an static electrical arc followed by a high pitched short sissss---in one ear---mri fine, ---increasingly coming in flurries---some several seconds---frightened ----ent hadn't heard these symptom--sending me to specialist--called their nurse--hadn't heard symptom before. My whoosh sounds like... Pulmonic stenosis. My whoosh sounds almost like atrial septal defect. My whoosh sounds like Aortic stenosis. It's late and it's driving me insane. My whoosh sounds like bubbles that go to the tune of my heartbeat. My boyfriend can hear them if he lays his ear to mine... It's constant but worse at night. I'm going insane!! Great website, I'm pleased I'm not the only one with this. My whoosh sounds like a fetal heartbeat, constant for the last 3.5 years. Getting louder, wakes me up and only stops if I press the vein/artery in my neck. Awaiting results of MRI scan. Thank god I'm not the only person experiencing this. Drs look at me as if I'm a crazy lady. My whoosh sounds like... drumming/pulsing. I've had it for about 10 months. Sometimes drives me mad. Had MRI and nothing found, blood tests, etc. Next going to see neurologist, but had previously been told by two specialists to live with it and no more tests needed. Have reduced hearing in the ear I hear it in. Very distressing! My whoosh sounds like...ar.mp3 under "Link 4"
My whoosh sounds like...Ventricular septal defect. My whoosh sounds like...VSD except mine is higher pitched. My ear sound sounds like a white noise with a hearty rhythmic pulsing in it. If I depress my artery, the pulsing stops, but not the white noise. I have a 40% hearing loss in both ears and have been diagnosed with subjective/hearing loss tinnitus. The pulsing varies in level a lot, and on the occasion I was with a specialist it was low and they could not hear it. But when it is elevated it seems pretty loud to me. I would like to figure out what it is. The intermittent pulsing seems to be a strange symptom. I am not hypertensive, have had a number of tests -tumors, stenosis, etc. Wow... I can't believe it. It is like I have found a support group! I am loving it. Thank you so much for this site! I listened to audio clip after audio clip. The one that sounds the closest to mine is the VBS clip off of link #2. My whoosh sounds like VSD but more whooshy. Would agree with the person who described as it as the noise heard on a fetal heart monitor. I have had it for 5 weeks and very sad to keep reading on the web that I will have to live with it. I was hoping for a cure as it is driving me mental! Awaiting appointment from a specialist in the next fortnight so fingers crossed! My whoosh sounded most like the VSD, but it was a little bit less of a hard sound and more of a whoosh. I just took a listen and I would describe mine like a VSD too. I've always described it as the same sound you hear when you place a doppler probe over an artery. Mine sounds like VS Defect test sound. Hi. I have had Pulsatile Tinnitus (whoosing sound) for about a year now. Previous to this, I had regular tinnitus (more of a buzzing/ringing sound) off and on for about 7 years. However, the regular tinnitus was intermittent and the pulsatile tinnitus is constant (24 hours a day, 7 days a week). My family physician told me I could see a specialist and take a battery of test, however he didn't think it was anything to worry about..that there was no cure...and try to live with it. I have gotten somewhat used to it, but it is very annoying, especially at night. I may try and see a specialist in December and go for the battery of tests. I am over 50 years old and live in Chicago, Illinois. I was happy to stumble upon this site. I guess misery loves company. I've been suffering with this nearly a year now. It's always reminded me of the sound I heard when the doctor would check fetal heart tones when I was pregnant. Your sound links here to all the heart sounds make me even more certain and will give me the language to describe it. I've thought for a while that I have subclinical hypothyroidism but can't seem to get anyone to agree with me; this is yet one more symptom, though I know it can be many other things as well. Thank you for your site - I definitely have a whoosh and not a ringing, so it's good to have a name for it. I could not find mine. I will describe mine as a metalic sound. Mine's like asd in the last set. Not always pulsing but always whooshing.